With a super-bright screen, HP promises easier work outdoors. HP has unveiled an all-new EliteBook and Chromebook offerings at CES 2019. 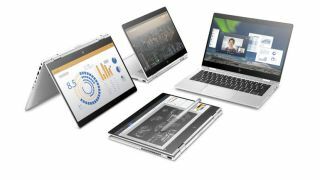 The HP EliteBook will carry the number of x360 830 G5, and HP calls it “the world’s brightest business convertible”, which aims to “bring x360 versatility mainstream for on-the-go workers”. With 1000-nit brightness, this machine’s display should be clearly visible even in bright outdoor environments. As usual, these convertibles can be used in standard laptop mode, as a tablet, or as a tent. The new offering comes with up to 32GB of RAM, and up to 2TB of SSD storage. It will be powered by with 8th Generation Intel Core processors, from i3-8130U to i7-8650U, but without a dedicated graphics card. Instead, we’ll get the Intel UHD Graphics 620. The EliteBook should be available in April this year. Pricing is still not announced. As for the Chromebook, it carries the name of x360 14 G1 and is more IT-focused. It comes with IT-oriented security and manageability, while Chrome OS offers verified boot and application sandboxing. Users can also expect an all-new Chrome Enterprise License which offers granular control of more than 200 policies across different users, devices and applications. The Chromebook will be powered by an Intel Core i7 processor, and should be available some time next month, but the pricing, just as with the EliteBook, is still not available at this time.